The field of candidates hoping to succeed Suffolk County District Attorney Dan Conley continues to expand. Gregory Henning, a 38-year-old Dorchester resident who has worked as a prosecutor in Conley’s office for more than a decade, hopped on the campaign trail on March 1. 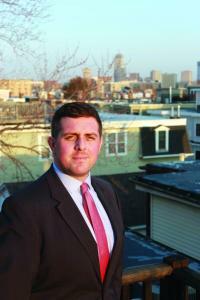 Henning, the son of the late iconic Boston newsman John Henning, is a native of Boston who has settled in Dorchester’s Polish Triangle neighborhood. He has worked in the district attorney’s office since 2006, with a break in the middle to teach. He said his knowledge of the office’s inner workings make him the best suited to implement progressive changes while respecting the processes in place. The prosecutorial system can account for the full scope of defendants’ lives, and serve a role to divert and better support those who interact with it, Henning said. Henning grew up on Beacon Hill with his father, mother, and older brother. After receiving his bachelor’s in government at Harvard, he earned his law degree from the University of Virginia before returning to Boston. He held a summer job at a Boston law firm for one year while in law school, and another at the Suffolk district attorney’s office. The summer at the district attorney’s office was formative. After getting his law degree, Henning returned to Conley’s office as an assistant DA working in Boston Municipal Court, then moved up to chief of the gun prosecution task force, and on to the major felony bureau. He then took the break to teach, and returned to the office to work in the senior trail unit. Since October 2016, Henning has been chief of the office’s gang unit. He has lived in his Polish Triangle three-decker for about ten years, sometimes with a roommate, sometimes using the space as a temporary shelter for the young people he has mentored, and now with his girlfriend. While in the major crime unit, Henning started volunteering with College Bound Dorchester at the Little House on East Cottage Street in 2009. One of the young men on the College Bound basketball team was a defendant whom Henning’s unit prosecuted while he was in the gun unit. After his first five years as a prosecutor, he wanted to “try to get to the guys like him before they got caught up in the system.” He took a job teaching at Boston Preparatory Charter School in Hyde Park from 2011 to 2012, then worked as a senior advisor to Joe Kennedy III during the latter’s successful run for Congress in 2012 before returning to the district attorney’s office in the major felony bureau. Along with the evolution in his thinking about prosecution, Henning left teaching but held onto his role as a support structure for several of his students. He has mentored more than 20 young people, whom he calls his “kids,” including former students and criminal defendants upon their release from custody. He has supported them by teaching them how to pay bills and taxes, take driver’s tests, work on resumes, and apply for jobs. The system paints prosecutors as the opposition, Henning said, and trying to change that impression with some of the defendants was important to him. He made time to visit and talk with about a dozen defendants in custody and work with them when they were released, coordinating with attorneys and social workers to help the defendants get into job training. A program Henning put in place during his time at the gang unit can be a “model” for changing prosecutorial practices to the benefit of defendants and the community, he said. It allows prosecutors to consider additional life context in mandatory minimum cases and possibly work with defendants to find options with reduced or no incarceration in return for diversion and additional support. If they have the capacity, Henning said, prosecutors can help assess defendants’ needs and direct them to appropriate resources. He is familiar with the other two openly seeking the seat in the Sept. 4 primary — state Rep. Evandro Carvalho and defense lawyer and youth services manager Shannon McAuliffe. He and Carvalho, a former prosecutor, did not overlap for long in the district attorney’s office, but Henning has directed some defendants to Roca, the program with which McAuliffe works. Like anyone who has worked in the same office for a decade, Henning says he can identify numerous areas for improvement in the Suffolk County district attorney’s office. There is a bandwidth issue because of the sheer volume of information to assess in an era of security cameras, social media, video, and other digital records. He sees the potential for a unit focused on cyber crimes.